Photo courtesy of Palm Bay Fire Rescue. 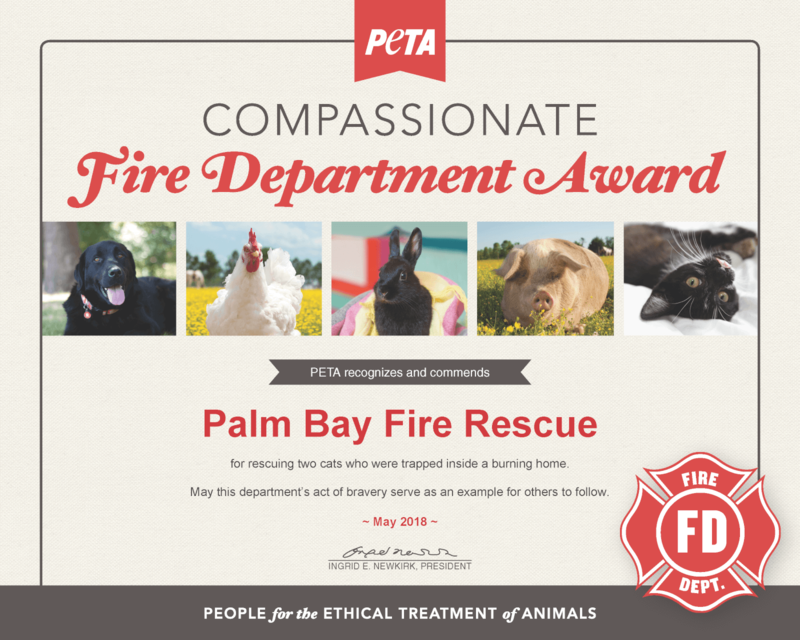 PALM BAY, Florida – A Compassionate Fire Department Award is on its way from PETA to Palm Bay Fire Rescue, which responded to a house fire on Bianca Drive N.E. on Sunday afternoon. Firefighters searched through the home and discovered that while the human occupants had evacuated, cats remained inside. Two had died in the fire, but firefighters were able to rush the two surviving cats outside. While one kitten was unconscious, firefighter Sean Casey and driver engineer Jacob Couture used a special oxygen mask to revive her. “These courageous firefighters did everything that they could to save these cats, and they even brought one back from the brink of death,” says PETA Vice President Colleen O’Brien. “PETA hopes their kindness and bravery will inspire people everywhere to act when animals are in need,” O’Brien added. The fire department will receive a package of PETA’s fire-alert stickers, a framed certificate, an award letter, a box of delicious vegan cookies, and a copy of The Engine 2 Diet, which is a Texas firefighter’s 28-day plan for staying in prime firefighting shape by eating vegan meals.